I love fall decorating, and I really enjoy Halloween, but frankly, indoors, my fall decor wins out. But that doesn’t mean I want to 86 the idea of having some Halloween fun! My solution is to come up with some DIY outdoor Halloween decorating, so that I can enjoy the “holiday”, but not compromise the indoors. In other words, no spiders allowed inside my house! 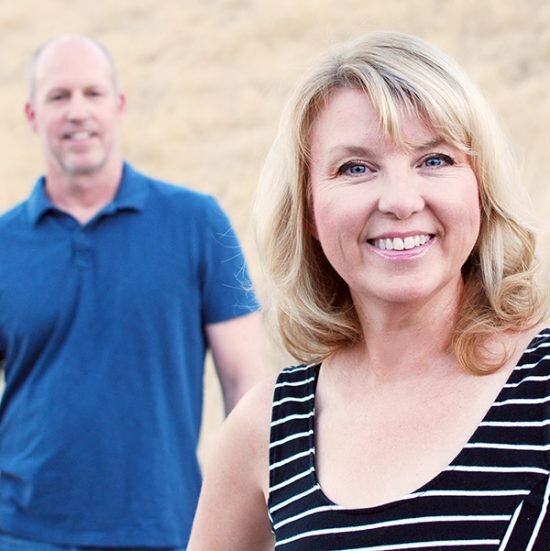 So this year, Steve and I have gone out and found some great front porch & outdoor Halloween decorating ideas, and are sharing our favs here with you. Some are tutorials, some are just great ideas, all of them are fun! 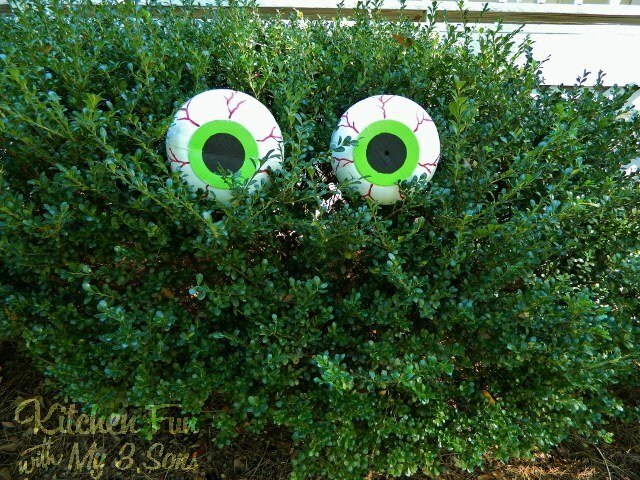 So we love this cheap outdoor Halloween decorating idea from ‘Kitchen Fun with My 3 Sons‘! These are just inexpensive dollar store plastic pumpkins, with some paint magic. Easy tutorial, and fun to do with the kids! 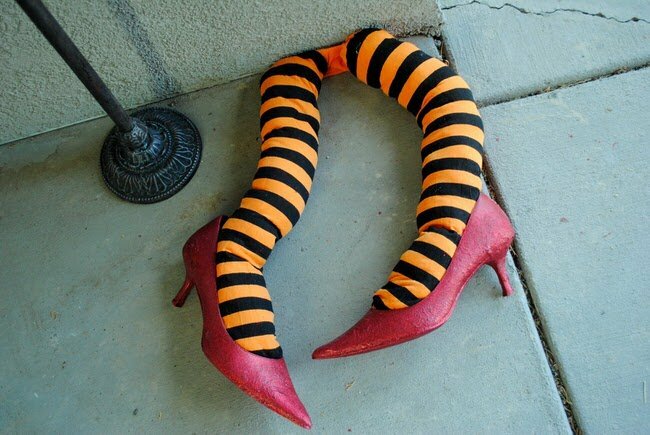 Ok. Best DIY outdoor Halloween decorations, ever. 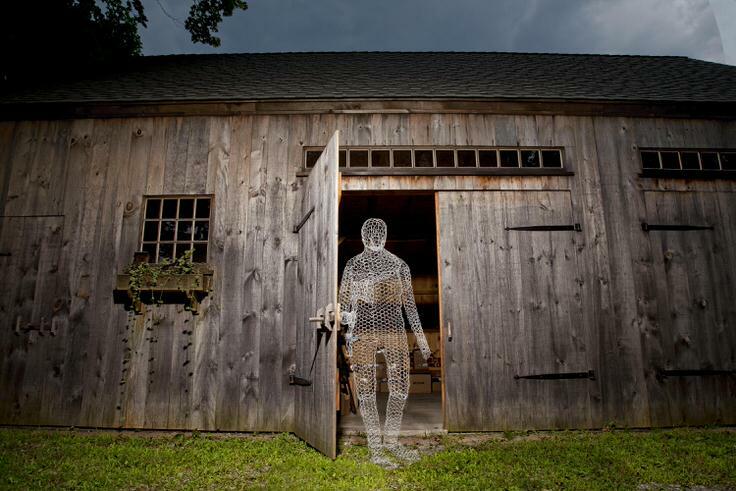 Learn how to build this ghost from wire for less than $20! Creepy, and what cooler than a giant blow up pumpkin! 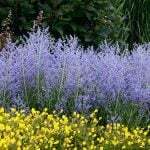 From ‘This Old House‘. Use a drill to make these “Trick or Treat” Jack o’ Lanterns. Of course, you can use any phrase you want..scary, or family friendly! 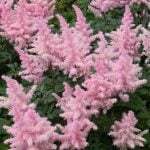 From ‘Country Living‘. If you want a little more Jack O’ Lantern in your outdoor Halloween decorating, try this DIY pumpkin tower from ‘DIY Candy‘. 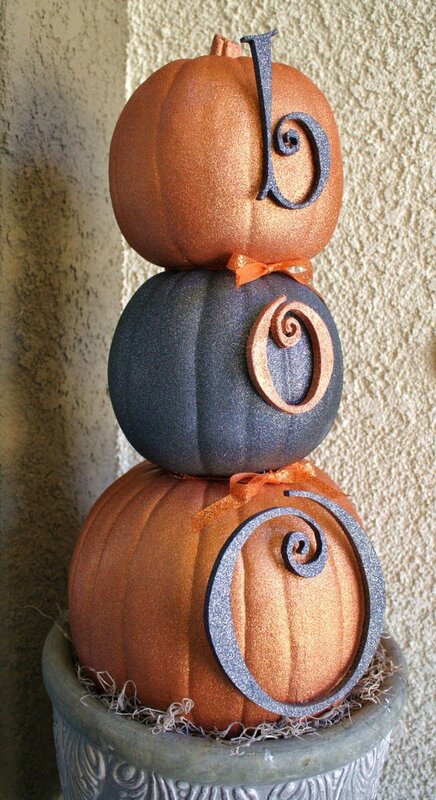 Another cheap Halloween decoration, you can get these faux pumpkins at the dollar store or a craft shop. 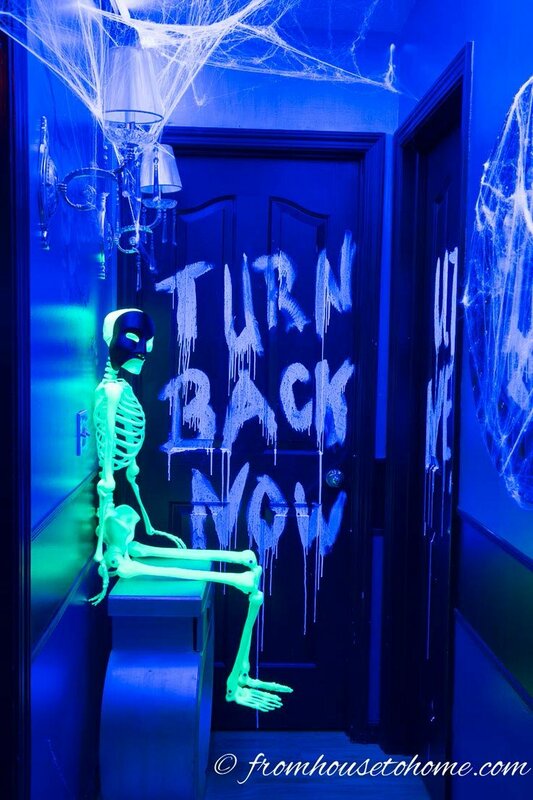 This easy Halloween decorating idea is from ‘Chapman Place‘. 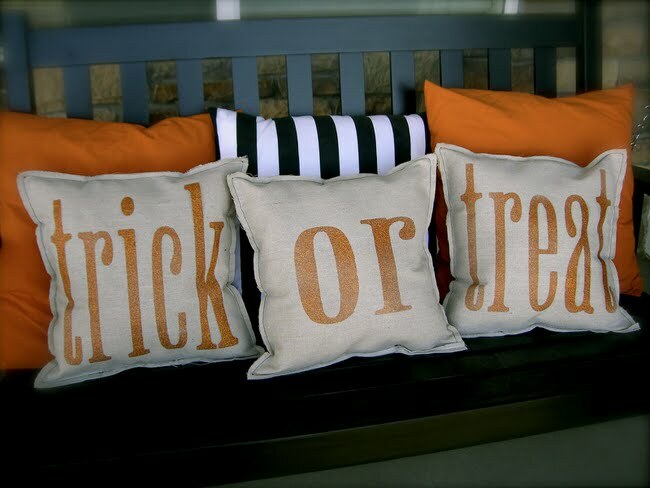 You can learn how to make these glitter trick or treat pillows out of a drop cloth, or you can purchase them at her Etsy store. So cute for a front porch swing! 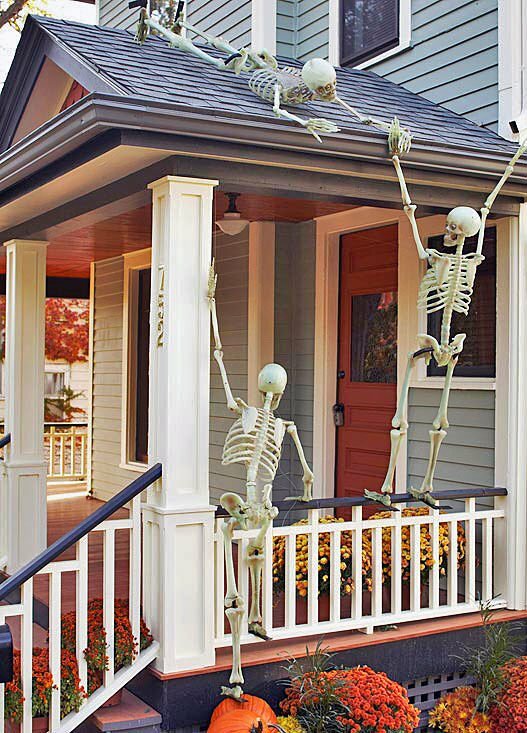 From ‘BHG‘, these rooftop skeletons are held in place with invisible fishing line… Obviously, how you pose your skeletons is key! 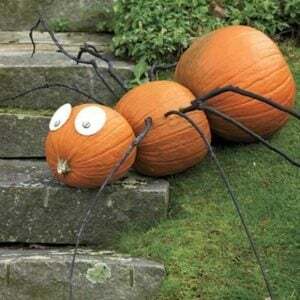 These Halloween yard decorations make me smile and creep me out all at the same time. 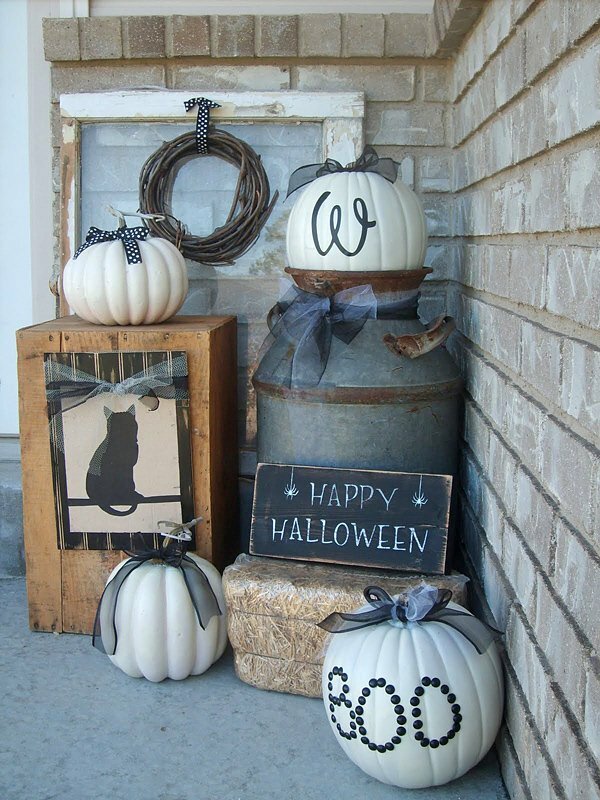 ‘Weekly Scrapper‘ made this tutorial on their countdown to Halloween project from cedar boards, but I imagine it would look amazing with reclaimed or scrap wood as well! A stencil, some paint and a dollar store chalkboard completes the countdown. 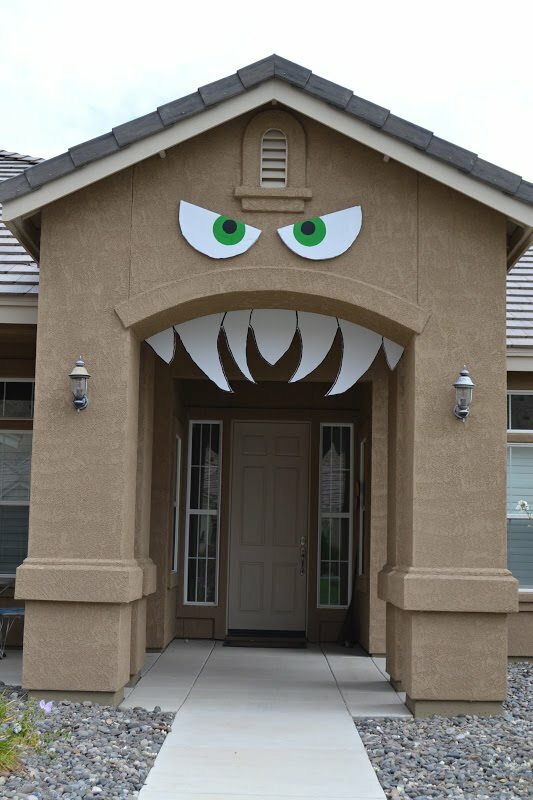 Make this Halloween house (on your house!) 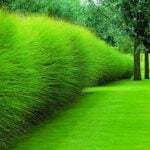 with this easy, and inexpensive project by ‘Nifty Thrifty Living‘. How fun is this?!! 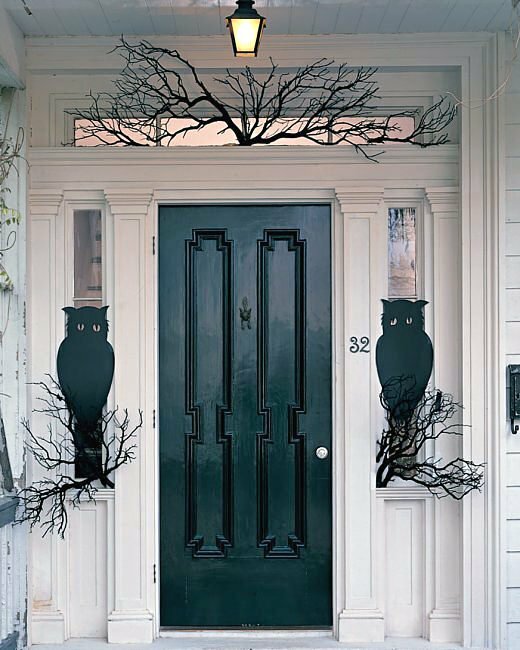 Make these owl night watchers for either side of your front door, from ‘Martha‘… They made these out of poster board (it would have to be a protected porch!) but I’m thinking black craft foam would stand a little light weather… Just print out the template and then trace onto the craft foam… You will have to go to your craft store to get large sheets of craft foam, or I found rolls of it online at Consumer Crafts. 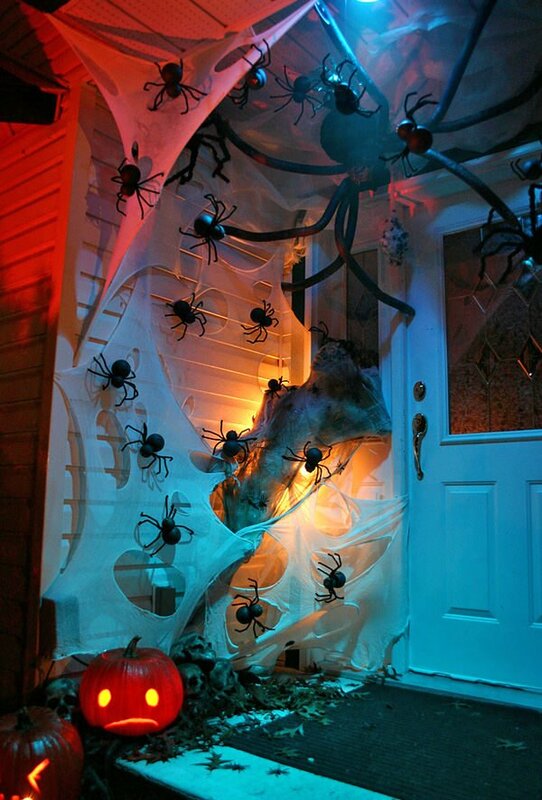 This one is just an inspirational idea, done with discount store spider webs and spiders… Great idea for how to lay out a real spooky front porch! Lighting is key! 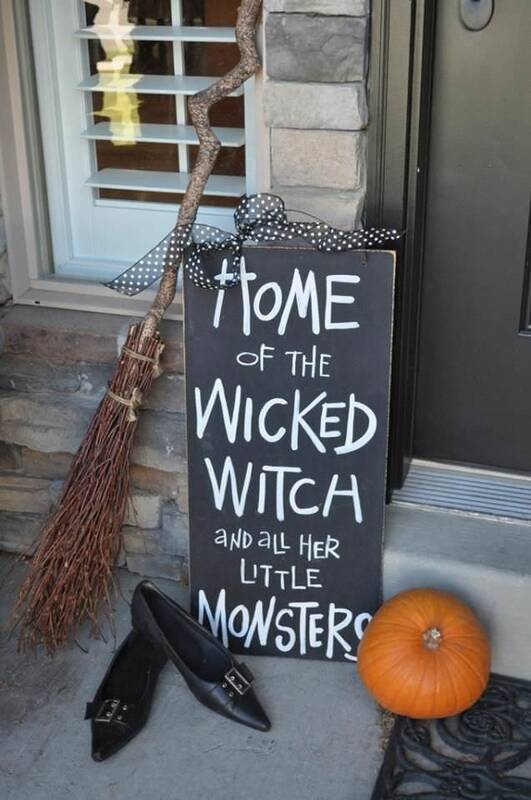 Now this is outdoor Halloween decorating at it’s finest! Photo found on ‘Flickr‘. More inspiration from ‘Craft Critters‘… I love the black and white! 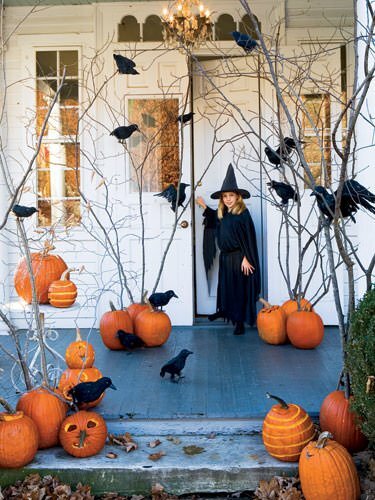 From ‘Good Housekeeping‘, anchor large branches into holes drilled into pumpkins, and add black ravens. Simple! 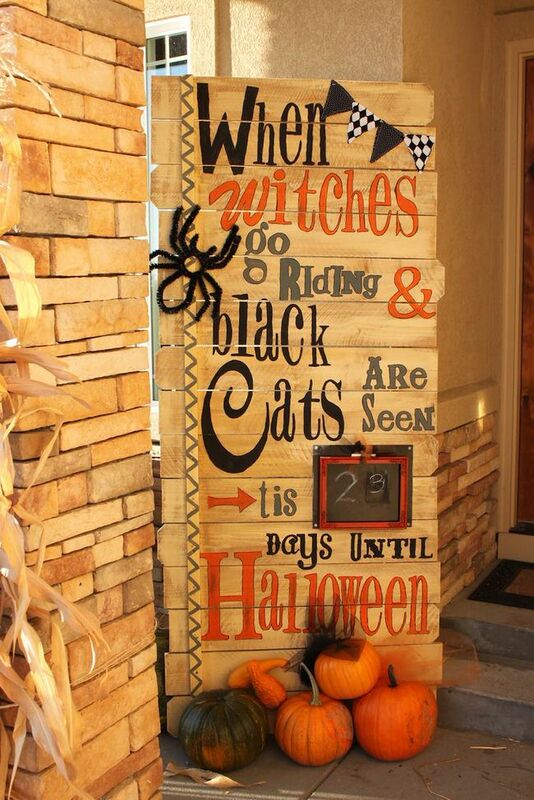 From ‘Boston Interiors‘, another sign for Halloween, get out the stencils! 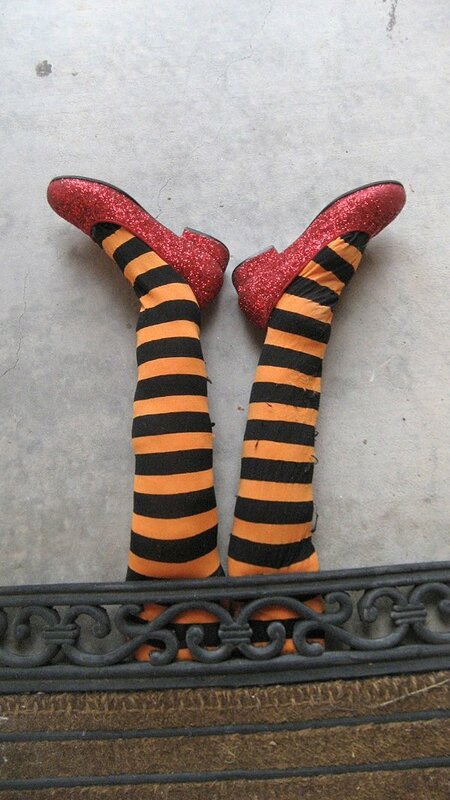 Speaking of witches, ding, dong, the witch is dead! 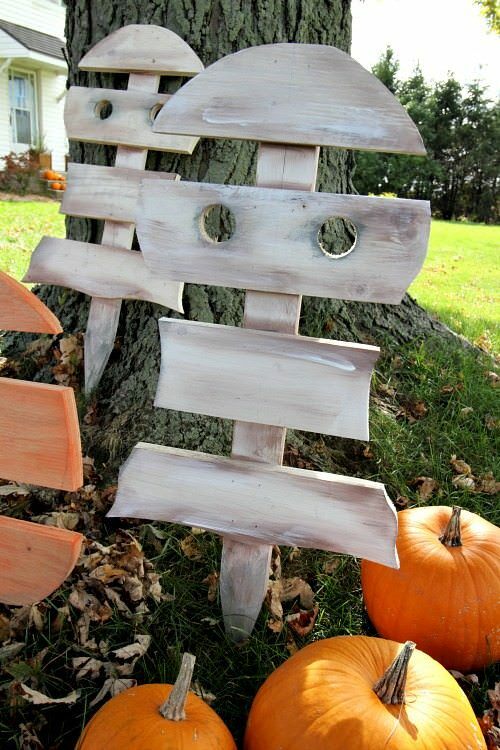 Here is a easy Halloween decorating outdoor project that is really cute! From ‘Holiday Snobs‘, check out their tutorial. And another version from ‘Come Together Kids’! I love how realistic this is! 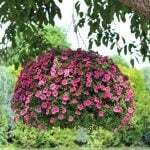 Finally, this glitter pumpkin topiary by ‘Diamond in the Stuff‘ is the perfect Halloween porch decoration for someone looking for a little glitz… Elegant Halloween decorating, I love it! 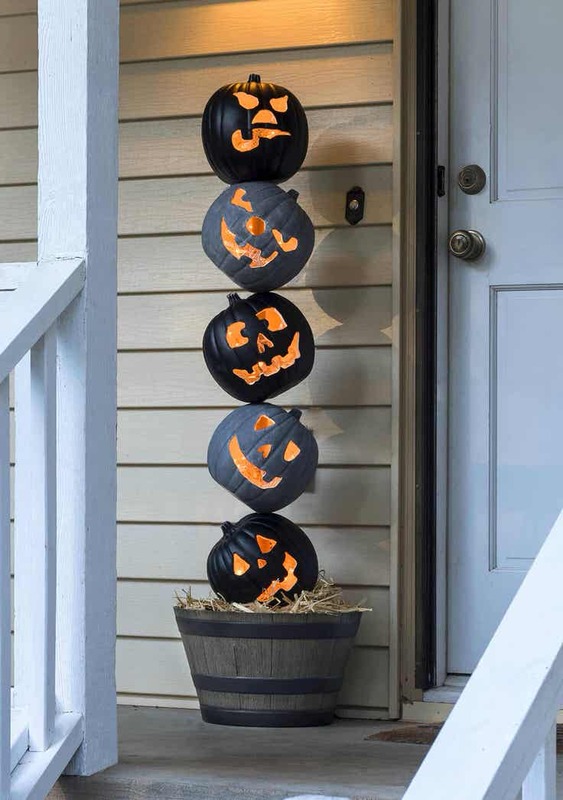 Love all these wonderful Outdoor Halloween Decorating Ideas? Looking for more? Check out our post on DIY Pumpkin Carving with a Drill! 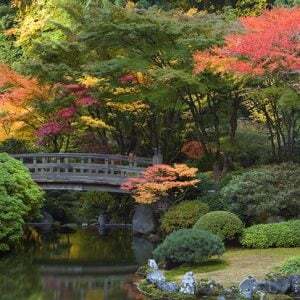 10 Gardens to Visit Before You Die!